When it comes to periodontal disease pamphlets, Periodontal Disease: Don’t Wait Until it Hurts is the finest in the industry. This overview of perio – from prevention to treatment – makes it an effective material for a huge portion of your patients. At #1 for over 100 years, the best just keeps getting better, with new features helping it maintain its top ranking. 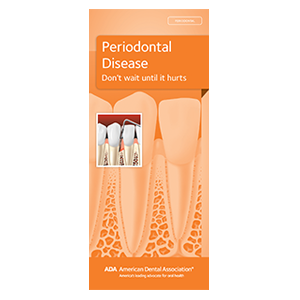 To give your patients a solid overview of periodontal disease, consider the industry’s top periodontal disease pamphlet. This clear and informative material provides them with everything they need to know. Order your Periodontal Disease: Don’t Wait Until It Hurts booklets today!